Print2CAD 8th Generation is able to convert PDF files into a DWG or DXF file, which can then be imported into any CAD system where it can be edited. 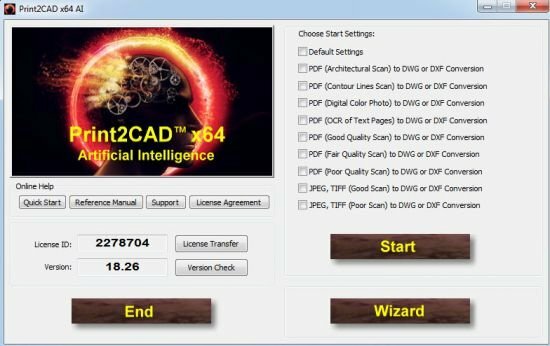 Print2CAD 7th Generation is an autonomous and CAD system-independent program. Print2CAD 8th Generation also converts DWG/DXF into PDF, TIFF/JPEG into DWG, DWF into DWG/DXF and HPGL into DWG/DXF. - Vectorization of Raster Pictures, OCR of Text, Line Type Recognition, Recognition of Circles and Arcs, Calibration of Coordinates. Clean Up of Input. - OCR of Text as Line, Rater Picture, or Solid Hatch. OCR with Dictionaries, and Clean Up Parameters. Automatic or Half Manually Separation of Text Areas. - Recognition of Small Dashes in PDF as DWG Lines with Line Type. Recognition of Dashed, Dashed Dot, Dashed Dot Dot, Dot Dot Line Type. - Recognition of CAD Circles, Arcs, Texts, Layers, Line Types, Walls, Contours, 90 Degree Corners, Horizontal and Vertical lines. - Zoom and Print DWG Flies. DWG Postprocessor: Edit the Colors, Change the Layer Names, Change the Text (Translation), Change the Fonts, Sort Entities on Different Layers. - Freehand Lines, Leaders, Revision Clouds, Layer Management and Layer Settings Manager. - English and German Manual as PDF and HTML, Spanish, French, Italian Interfaces. Training videos in English and German. Weeky Webinars in English and German. - Print2CAD 2018 is based on Trusted DWG™ from Autodesk® and developed with the help of Autodesk RealDWG™ Developer Tools. Print2CAD recognize main CAD entities. Normal well-created PDF files contain lines, hatches, circles, and arcs as PDF element paths or PDF element Bézier curves. Circles or arcs do not exist in PDF definition; they are Bézier curves or polylines. A human has the capability and intelligence to recognize circles and arcs, however for software to have this same type of recognition takes a lot more effort. Print2CAD provides advanced methods for circle and arc recognition. Print2CAD converts and vectorizes raster pictures from PDF, HPGL, DWF, TIFF, and JPEG files. The input files can be done using a scanner or generated directly from CAD systems in different quality levels. With the help of Raster to Vector Methods, Print2CAD can recognize all circles, arcs, and lines. With the help of OCR (Optical Character Recognition), Print2CAD can recognize Texts. With the help of Pattern Recognition, Print2CAD can recognize dash or dash dotted line types. With the help of coordinate calibration, Print2CAD can correct the accuracy of the converted drawing. Print2CAD not only uses conversion and vectorization methods, but also uses OCR (Optical Character Recognition) to reconstruct the content of a PDF or raster file. The program can also recognize the PDF text that has been deconstructed into polyline fields, and/or pixel pictures as full and editable CAD text. Print2CAD merges characters into strings and places these strings as texts in the DWG or DXF drawing. Print2CAD can precisely adjust, de-skew, and turn the converted drawing with the help of any number of arbitrary calibration points. One can be certain that a 3 foot thick wall will remain 40 inch thick after the conversion and will not be 39.9 inch thick. Likewise, a horizontal line will stay horizontal after the conversion. Print2CAD recognizes the dashed or chain dotted line types, and will connect them to form a proper CAD line and/or polyline with a line type. The lines may have any angle of inclination. Convert PDF to DWG in one run with a hundreds of files. PDF to AutoCAD settings included. DWG to DWG converter included.